Eye Exam: If the Lions Aren’t Cowardly, Who Is? The exhibition that proceeds from these conceits is at once decorous and excessive. Facing the entrance to the galleries is a two-story-tall rendition of an untitled 2010 photograph by Rog Walker—a dazzlingly deep depiction of a besuited man whose hands cross in front of him, heavily ornamented with gold glinting jewelry. Facing this image is Allison Janae Hamilton’s “Tell me no tales,” 2013. 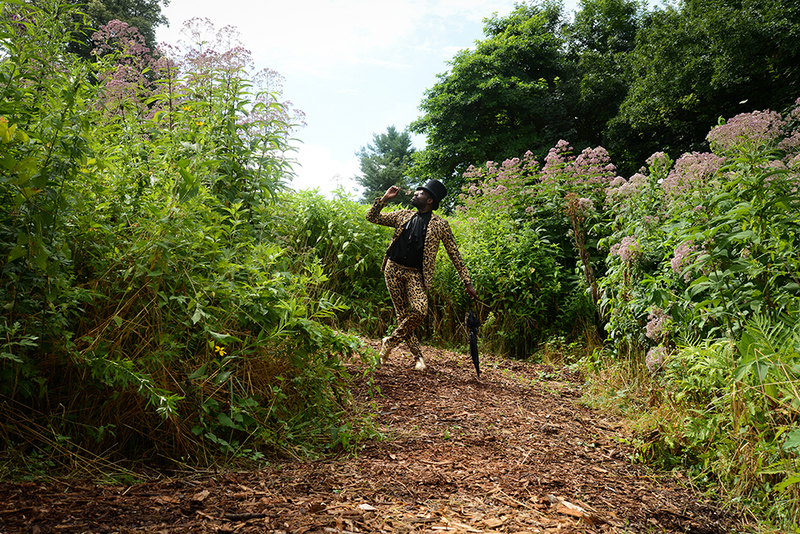 Performance artist Andre Singleton poses for Hamilton outdoors against a grassy, blossoming landscape. Wearing a leopard-print leotard styled with black ascot and top hat, Singleton is the Cheshire Cat amidst this lion’s pride, a stylistic divergence from the spectacle of the suit. 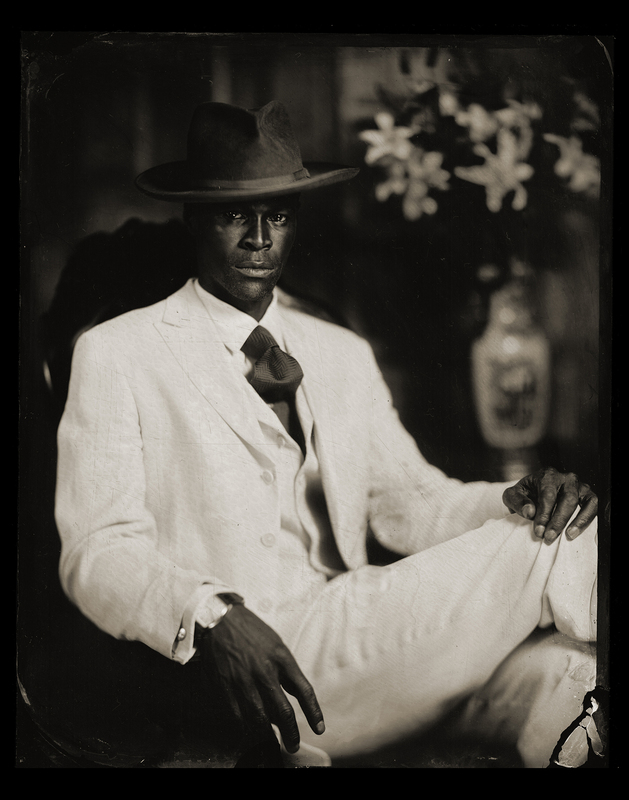 Winding up through three floors of exhibition space, including staircases and passageways, thirty-ish photographers have documented the style and life of black dandies as they occur globally in Africa, Europe and the United States. Across this diverse geography, these fashions uphold a proud, regimented outward self-expression, and the point is that these sartorial turns are exceedingly developed surfaces that anticipate being looked upon. While these men’s style of dress is positioned at odds with a prevalent form that Lewis identifies as today’s “hip-hop aesthetic/urban apparel [dictated] by corporate interests that capitalize financially off of the fabricated construction of the Black man as thug,” they actually work in relation to powers regulated by the gaze: it’s not only thoughtful accessorizing that completes these looks but a moment of being seen and recorded, thereby adjusting the circulation of images depicting black male bodies toward a portrayal of dignity and masterful self-invention. The wide range of photographic mediums used for producing these images call attention to the layers of manufacture—not only the tailored veneers of the figures reproduced but also the formal controls that reside in the vision of the photographer. Jody Ake’s untitled ambrotypes gorgeously employ a fussy darkroom technique that underscores the complicated relationship to history this style of dress enacts. Jamala Johns’ “Dandy Wellington” series is hung in a column, showing a dapper young man fragmented and disordered as each image tracks his thoughtful choices in accessories. A cantaloupe-hued attaché, boater, natty pink bowtie and yellow boutonnière coordinate to mint jacket and socks: it is the camera rather than the model that does the deconstructive work of parsing the traditions that his attire evokes. Finally that word: tradition. One of the most arresting works included in “Dandy Lion” is Harness Hamese’s “For every strong woman, there are strong men—Khumbula,” 2014. The viewer faces off with a sightly woman flanked by six gents wearing impeccably selected vintage costumes and severe facial expressions to match. 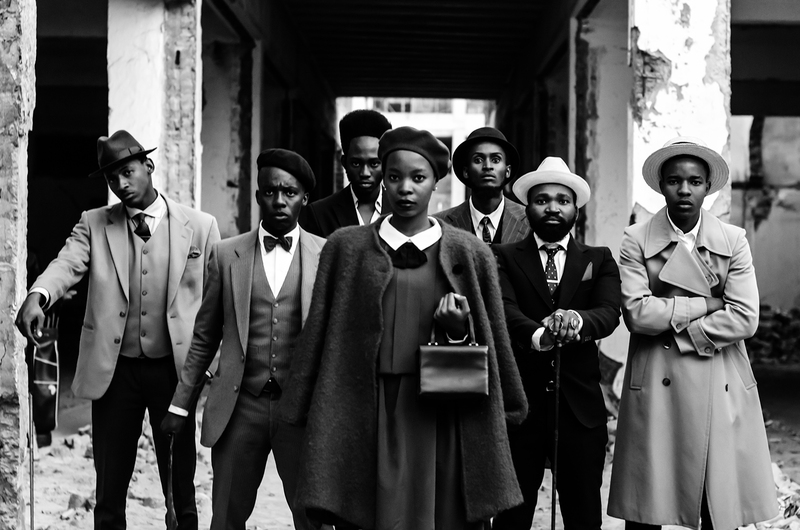 The photograph belongs to a suite of works Hamese made in Johannesburg with the fashion collective Khumbula and Namibian designer Loux the Vintage Guru. Its title alludes to the gender trouble that crops up in the exhibition. The show’s subtitle proves to be very specifically selected; “(Re) Articulating Black Masculine Identity” doesn’t particularly signal disarticulation of any of these identifications, but rather looks for ways to reassert traditional racialized treatments of gender into present-day discourses. One of the risks in reviving a historical form (of fashion, of social roles) is the ways that the apparatus within which it came about might be reconstituted in the process. In this case, dandy lions are presented in reaction to the poor light in which urban black men are typically portrayed, but they also conjure a gender politics in which masculinities and femininities are treated harmoniously and with some variation, but ultimately function as stabilized categories. I attribute these norms to the ways the exhibition courts a project of black respectability. Writes Lewis, “Dandy Lion is tethered to a fine line between oppositional fashion and respectability politics…and I’m totally ok with that.” I humbly offer that I am not totally okay with that. As scholar Kali Gross writes, “Claiming respectability through manners and morality furnished an avenue for African Americans to assert the will and agency to redefine themselves outside the prevailing racist discourses… it has also resulted in the proliferation of analyses which can be characterized as culturally defensive, patriarchal, and heterosexist.” “Dandy Lion” excels at the former and may not altogether avoid the latter. While the men and their lives that are modeled in “Dandy Lion” may not be what Essex Hemphill called “denials and abbreviated histories riddled with omissions,” gender’s relationship to sexuality goes mostly unarticulated here. Indeed, earlier iterations of Lewis’ exhibition (it has traveled internationally for several years) was exclusively focused on the dandified fashions of straight identified black men to contest the assumptions of homosexuality applied to flamboyant styles of apparel. Certainly among the liberties of a burgeoning queer politics is to uncouple signs from what they have been held to signal, but Hemphill and other queer black artists and writers like him have struggled against a reflex for paranoia toward and repression of sexual difference being seen and named within black communities. 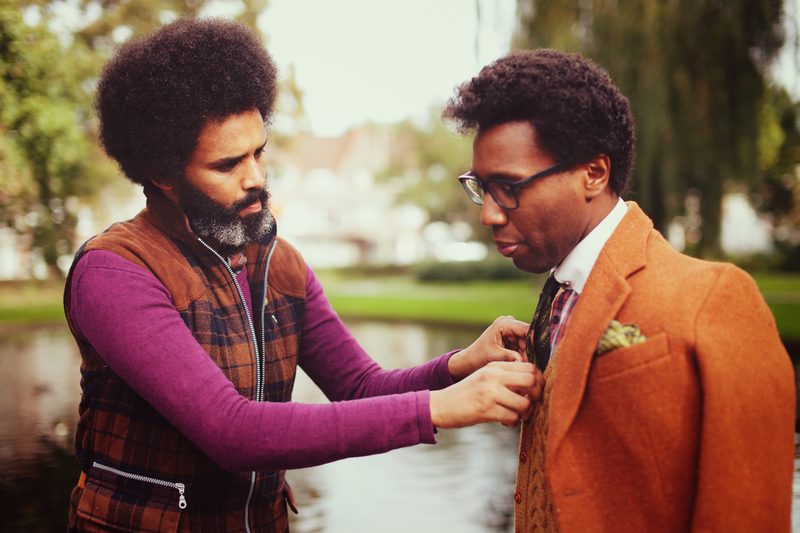 Richard Terborg’s tender picture of one man adjusting another’s jacket may have read with a productive openness of friendship, brotherly affection, social preening, or romantic partnership but for the accompanying images of one of these men in a domestic setting with a woman and child, and the title “Family First.” When respectability so often hinges on traditional, normative family values, the assumptions about someone’s sexuality isn’t the issue under duress, it’s the safety and celebration of his active self-identification that I am looking for. The metrosexual moment that Lewis and others identify as a point of comparison to this dandy culture presented bolder, finer, fiercer fashion options to a het male mainstream—brought to you by “Queer Eye for the Straight Guy,” in other words, by men who risked their social standing, families’ perceptions and bodily harm to deviate beyond the prescribed appearance of normative gender and sexuality. In a project that is as recuperative and remembering as this one, these lives lived in those clothes mustn’t be elided, and perhaps in future iterations may become an additional node of discourse. Just about exactly where Eve Kosofsky Sedgwick could have told us we would find it, the gesture that is for me queerest in “Dandy Lion” is at the center of the galleries. 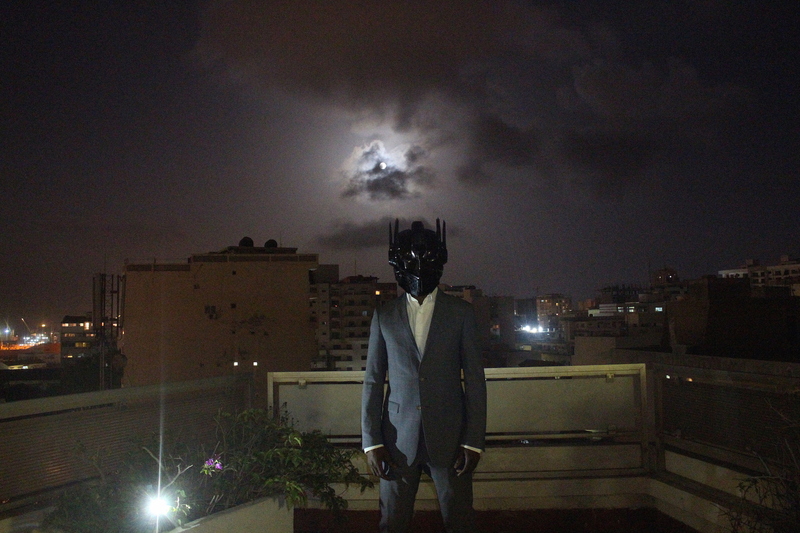 The inclusion of “Atlantic Transformerz: Faidherbe,” Charl Landvreugd’s conceptual cos-play photograph, Lewis writes, “definitely speaks to my deliberate intentions to mask, not shy away from, discourse about sexuality.” Standing before a darkening twilight, a man wears a tailored suit and a shiny black Transformers mask. Undaunted Afro-futurist superhuman, he counters a prevalent nostalgia with the possibilities of what he and his audiences may yet become.